Pharrell Williams and Missy Elliott perform at the 2014 BET Awards. The BET Awards show has been marred in recent years with violent encounters. In 2012 rappers Rick Ross and Young Jeezy had entourages of long T-shirts and heavy necklaces that came to blows, and at the same show, rapper Gunplay got mollywhopped by 50 Cent's crew. This year, at the many "unauthorized and unaffiliated with the BET Awards" parties that capitalize on the celebrity cache that comes with the BET Awards coming to Los Angeles, "one person was killed and five were injured in separate incidents ahead of the show," Los Angeles police told the Associated Press. A man was stabbed in the stomach Saturday night, gunfire erupted at a restaurant early Sunday morning, and in the end, one person was dead and four people were injured. Chris Rock was killing time (something that happened so often, even he seemed to run out of things to say) as the host of the 2014 BET Awards, aka the "Black World Cup," which honors black excellence in music and film, and he casually dropped a joke: "The BET Awards show is the only awards show when your family hears that you're going and says, 'Be careful.' "
As with most of the jokes that Rock would make during Sunday evening's display of gaudy (think Nicki Minaj's mushroom-infused stage set) to goofy (think Busta Rhymes' jacket), the humor would be both eerily biting and funny. And while the show ran longer than a stretch Hummer (try close to four hours!) and had few highs (a Lionel Richie tribute and the unearthing of Missy Elliott for a cameo alongside Pharrell during his performance of “Come Get It Bae”) and a tidal wave of lows (Busta Rhymes' jacket—yes, it deserved a second mention; a plethora of washed-up R&B singers like Troop and Color Me Bad; and the sudden emergence of plaid as the unauthorized dress code). It still managed to pass out a few awards trophies (which, Rock noted, don't have a name). Pharrell won Best Male R&B/Pop Artist, and his annoyingly infectious "Happy" won top nod for Video of the Year. Beyoncé was named Best Female R&B/Pop Artist. New Orleans singer August Alsina was named Best New Artist, and Lil Wayne's rap collective Young Money scored Best Group. Drake, who was a late scratch from the award-show performance list, would win Best Male Hip-Hop Artist. Minaj was named Best Female Hip-Hop Artist and in her acceptance rant threw shade on all rappers who don't write their own verses: "When you hear Nicki Minaj spit, Nicki Minaj wrote it." 12 Years a Slave swept the film categories, with Lupita Nyong'o named Best Actress and Chiwetel Ejiofor named Best Actor. Civil rights activist Myrlie Evers-Williams was given the Humanitarian Award to commemorate the 50th anniversary of the Civil Rights Act being signed into law. The founder and CEO of the Urban Prep Academies in Chicago, Tim King, accepted the Shine a Light Award. Tennis star Serena Williams and NBA MVP Kevin Durant won Sportswoman of the Year and Sportsman of the Year honors. But what really took center stage Sunday night was that the BET Awards, which are often considered the black Oscars, were about as organized as Fred Sanford's junkyard. Let's start here: Lionel Richie, the big tribute, the big name, who once sported a big Afro as lead man for the Commodores, was set to receive the Lifetime Achievement Award. He was honored with a three-song medley from John Legend, Ledisi and Yolanda Adams. During his acceptance speech Richie would note, "Soul is a feeling, not a color. Talent is a God-given gift and not a category, and out of the box is the magical place where true talent goes to thrive and breathe." Perfect, right? Except while he was accepting his award, the banner across the screen had his name spelled wrong. While the Grammys were all about Pharrell Williams' stupid hat, this year the hat may have been replaced by Busta Rhymes' stupid jacket (third mention because it really was horrible). While many noted that Pharrell's ranger-esque hat was akin to the Arby's logo, last night was all about Busta's jacket looking a lot like a Cheesecake Factory bag. Arby's would later buy Pharrell's Vivienne Westwood hat on eBay for $44,100, with the proceeds going to Pharrell's youth charity From One Hand to AnOTHER. No word on whether Busta has been approached by the restaurant that specializes in cheesecake desserts. Chris Rock joked on everything from the Solange vs. Jay Z elevator attack ("Jay's a businessman now, he can't just go punching girls in the face—he's got a meeting with Nabisco in the morning") to Dr. Dre's $3 billion deal with Apple ("Looks like the West won. Sorry, Puff") to embattled Los Angeles Clippers owner Donald Sterling's NBA woes ("Now, let me get this straight: An 83-year-old white man doesn't like black people. Is that news? First of all, a black man couldn't look him in the eye until he was 45. The first black person he even met, he got for Christmas"). Rock even panned special guest and surprise performer Chris Brown right before his performance: "He just signed a new deal," Rock said. "Too bad it was a plea deal. Give it up for Chris Brown!" The only flub for Rock in this hosting gig was that he let viewers know each time production asked him to improvise. He would lean in and say, "Stretch," and then ramble about until it was time to go back into his prepared material. But the pièce de résistance that summed up the entire night came after the Young Money crew's acceptance for Best Group. 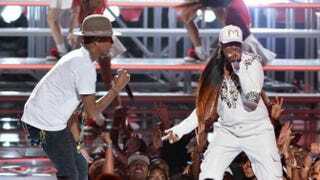 Lil Wayne and Young Money took the stage, and the rapper thanked his family (who all seemed to be up there with him) and God before letting out a throaty "Young Moolah Baby" and slamming the mic to the ground. Presenter Chadwick Boseman, who still had more to say, had to retrieve the mic stand and hold the mic together. "All right, Young Money," he said. Proving that slamming a mic doesn't mean it's the end of anything; in fact, it might've just broken the mic on an already shaky evening. Stephen A. Crockett Jr. is associate editor of news at The Root. Follow him on Twitter.